Guinea pigs and hamsters have some things in common, such as bedding preferences, the need for water bottles and their love of treats. It's not too difficult to tell the two apart size-wise, but look past their physical contrasts and you'll find the two also have different financial requirements, sleep schedules, life expectancies and personalities. Look at a hamster and guinea pig and you'll notice one difference right off the bat. Guinea pigs, in all of their chubbiness, have a hefty size advantage over hamsters, especially the dwarf varieties. Guinea pigs typically are between 8 and 12 inches long, making them quite a bit larger than Syrian hamsters, which usually average 5 to 6 inches in length at maturity. Dwarf hamsters are smaller, anywhere from the 2-inch Roborovski to a 3- to 4-inch Dwarf Campbell's. Guinea pigs typically cost more because they require a larger enclosure, more bedding and more food. Naturally, you'll also spend longer cleaning a pig's enclosure than you would a hammie's. On the flip side, guinea pigs aren't great escape artists because of their size. Hamsters are, dwarf hamsters especially. In fact, wired cages sometimes present a problem if you have a dwarf hamster, because the little critter can squeeze right between the bars. Guinea pigs are a long-term commitment, living happily until about 5 to 7 years of age. Hamsters tend to pass away in shorter time. 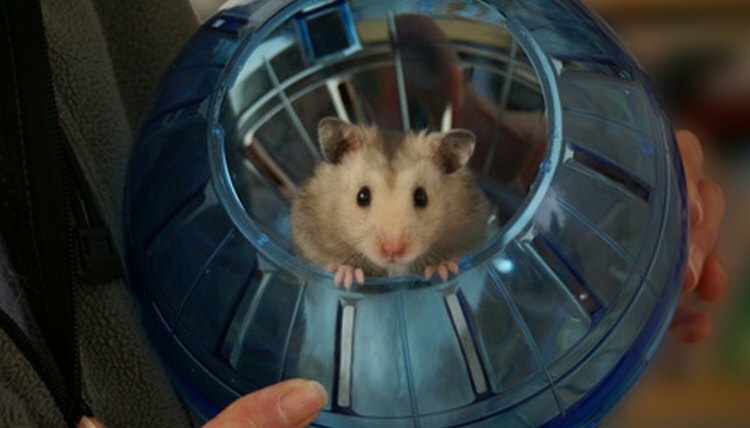 The American Society for the Prevention of Cruelty to Animals notes that Syrian hamsters live around 2 to 3 years and dwarf hamsters tend to have a life expectancy of only 1 to 2 years. This is assuming that the critter is healthy when you get him, lives a stress-free life and has plenty of daily exercise. Enjoy sleeping at night? Well, hamsters do not. The nocturnal critters are awake when the sky is dark, rummaging about, playing with their toys and having lots of fun. In contrast, guinea pigs are just like you, providing you don’t work a graveyard shift, and are awake during the daylight hours. However, guinea pigs have a tendency to be noisy creatures who sound off with lots of chirps, screams and assorted noises, some very loud. Hamsters also can be vocal, but typically not as often nor with as much volume as pigs. Guinea pigs and hamsters both need regular human interaction. Spending 15 to 30 minutes with the critter each day outside of his cage, but in a secure area, will make him happy and keep him healthy. Pigs tend to be more jolly and sociable, making handling easier, but Syrian hamsters typically warm up to a human touch quickly. Dwarf hamsters can make handling difficult, due to their small size, and because they sometimes take longer to feel safe and secure in your hands.